In order to help kids develop a healthy relationship with food, I believe it is essential to get them involved in the kitchen from an early age. Today we are going to cover a simple menu with a real wow factor that the whole family can be proud of! Some of the ingredients may seem a little scary but they can be gotten quite easily. This recipe is super quick and requires no cooking, but looks really cool! 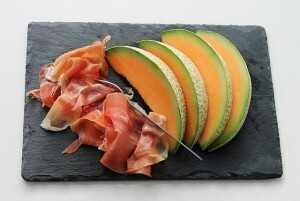 Wrap the prosciutto around peeled melon slices. In a jar or lunchbox shake up the oil, vinegar and seasonings together to make a dressing. Drizzle this over the salad and the wrapped melon. Boom! You have a restaurant quality starter done in minutes! Another dish that looks amazing but is super simple to make! In a little bowl mixed together the soy, honey, crushed garlic and pop it to one side. Cut out four bits of foil to put the fish and veg in – brush with oil and turn the edges up a bit. 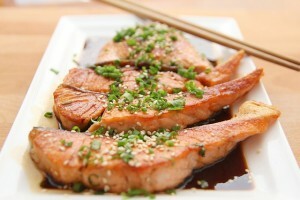 Fill the parcels by placing the vegetables in first, then salmon on top and scatter over finely chopped ginger. Drizzle over the sauce and a little sesame oil also if you wish. Close the parcels by folding the edges together and pop the four of them onto a baking sheet. This is the bit you must help the kids with – put the parcels into a preheated oven 200C/180CFan/Gas 6 for 20 minutes. When done, make sure you and not the kids, take them out of the oven and allow the parcels to stand for a minute before serving and transferring to plates. Sprinkle with spring onions and sesame seeds. Warm 2/3 milk in a small saucepan until almost boiling – take care with children whilst working near heat. Remove from the cooker, add the teabags and set aside for ten minutes to allow the peppermint to infuse. Whisk the sugar, cornstarch & salt in a bowl and add the remaining milk to this with the vanilla extract. Take the tea bags out of the resting bowl and pour the contents into the sugar mix stirring well. Then return it to the saucepan. Stir constantly over a medium heat until it thickens to a mayonnaise consistency. Remove from the heat and add the chopped chocolate, stirring until smooth. Pour into ramekins or glasses. 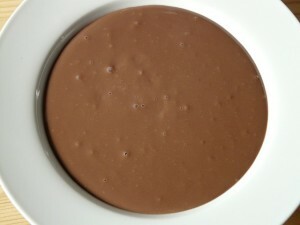 To serve cold ensure the containers, ramekins or glasses are covered with cling film (this much touch the surface of the pudding) and cooled in the fridge until served. Top with chopped fresh fruit, chocolate shavings, mint leaves or whipped cream. So there we have it – a full three course meal prepared with the kids. Each course only takes a little time to create and it’s a great way to get them involved with cooking and learning about food!